The future of business is AI – it’s here today, and getting smarter by the second. Many current operational systems and practices – both front and back of office – are already out of date and damagingly inefficient. Employees find their hands tied by hours of monotonous tasks that should and could be automated; customers find themselves bamboozled by irrelevant information on websites, frustrated at being unable to find what they need. How many man hours are taken up as employees struggle with legacy systems, inputting data multiple times? How many customers are lost as they fail to navigate the troubleshooting section of your website, or are left hanging on the phone? 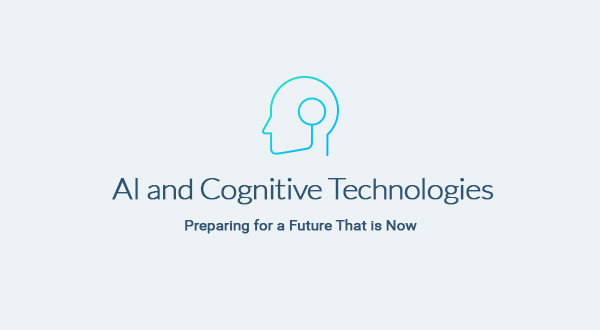 At the forefront of all sensible business minds and models is the looming impact of next-generation Cognitive Technologies and Artificial Intelligence (AI). If you weren’t already aware of how all-pervasive these technologies will become, get ready for decades of headlines in the business pages and a market you may find unrecognisable in just a few short years. The mass commercialisation of AI and cognitive technologies has begun. Leading organisations are already jostling for position, drastically overhauling and combating existing systemic inefficiencies, and stealing a march towards improved competitiveness. Are you prepared for this paradigm shift in the market? Can you afford to be left behind? There is no tomorrow, only today. Your IT department cannot delay and that’s where Enterprise Blueprints will prove crucial. Enterprise Blueprints will develop your awareness of the latest technologies, evaluate where they can best be implemented, and provide choices for creating optimum value. The future of customer service and sales advice is an automated system that learns and evolves on the job, fine-tuning its responses and expanding its capabilities. Growing more effective by the day, it gets people to the information they need faster than ever before, while in compliance terms it will find the right answer every time. Pore through big data - structured dates, transactions, stock prices, Twitter posts – and instantly discover patterns to predict customer behaviour, identify trends, and adapt your business model accordingly. Optimise your business with the most advanced algorithms in tech history, helping your business understand its market as never before. The automation of repetitive processes in your workplace can free your people to focus on more value added activities, leading to a happier workforce, greater efficiency, and reduced operational costs. Unburden your people from the humdrum of routine process and unleash their creative potential. Our focus on excellence is for your benefit. Our advice is consistently being sought out thanks to our demonstrable technical and domain expertise. We are always learning on your behalf, we make it our business to have clarity in our communication of the latest technological developments, so that you can quickly establish the need and value for your organisation. Our independence means that we are able to assess clearly from your perspective the best solutions for your business objectives.